I plan to order one of these or an M-422/55J14 in the next few weeks. I got stumped by the S,M, L sizing. Can anyone here provide their numerical chest size or weight and what size they ordered? I know there's a sizing chart on each listing but would like to hear what you guys went with. PS, the A-1 looks phenomenal Shawn. Really. I've purchased 5 jackets from Shawn to date, and all were made-to-measure for me. Shawn also sent pics when they were completed showing that my requested measurements were followed.. All fit perfectly as expected. Love your A-1 btw. Looks like custom is the way to go. Thanks. Technonut2112 and Shawn Ali like this. 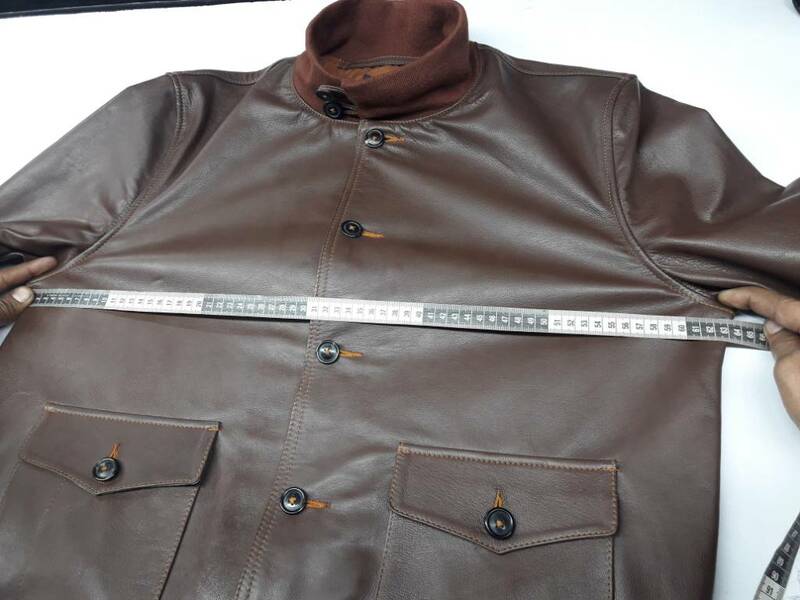 I have just received my Fivestar A-1 jacket, custom fit made to my measurements. For the price this is a stitch perfect constructed jacket in a nice supple goatskin leather and I cannot praise it enough. Reddish brown with rust knits, I paid extra for the horn buttons. Received the jacket less than a week from placing the order.Great customer service from Shawn, who was always quick to reply to my questions. s4rmark, Technonut2112, dinomartino1 and 1 other person like this. When I received my jacket I was very pleased with the quality but thought that the measurements I had given had made it a bit too slender a fit, but on measuring the jacket recently I have seen that it actually measures 1 cm less at shoulder, 2 cm less pit to pit, 3 cm less in sleeve and 4 cm less in length, so not really a custom fit after all, maybe leather is difficult to cut accurately when taking in to account the stitching of the various panels. Going to pass this jacket on to my Nephew who is a lot younger and slimmer. Well, I think the fit is ok. I do not see anything too slender. Maybe the sleeves are 1-1,5 cm too short for my taste. Actually I think it may be a little too big around the stomach. Yes, it`s really in the sleeves and back across the shoulder blades, it feels a bit too tight when you move your arms, so I need more leather pit to pit and therefore a bit more in the upper back, can only be worn over a shirt which is Ok but still a bit restrictive in movement. 1cm at shoulder and 2cm p-p isn't going to make a huge amount of difference, it would be different if you were talking inches. Wear it to death and it will form to your body shape. Changeling, Shawn Ali, Thomas Koehle and 1 other person like this. Thanks, if it swamps my Nephew when he tries it on then maybe I will just hang on to it and hope it molds to my shape a bit better. If it feels tight then pop a jumper on underneath ...and wear it to death again! With a jumper on I can barely move my arms, so tight is the fit, decided to pass it on to my more slender Nephew, sure he will love it. Thanks for the details and your concern, Well I noticed your problem, I also want to assure you I try my best to send you the exact size details, also I sent you all the size images and you were also happy, However I can understand your size problem whatever the cause is, I am agree to provide you a new replacement on 50% discount, Please just share the new size details you required I will follow them 100%, and I will also exempt any Charges of Customizations. I am hopeful this way we can solve your size problem. Replacement will be ready within 24 hours of confirmation. Do you have a slightly lighter seal brown goatskin than the one in the photos?" Who is this Changeling guy? Seems his tape measure is way out, he measures several times and comes up short every time. I think I will just stick with my A2, which is my favourite leather jacket style of all time, but I do recommend Fivestar for a good quality jacket at a low price for those who are still thinking of buying one of their jackets.